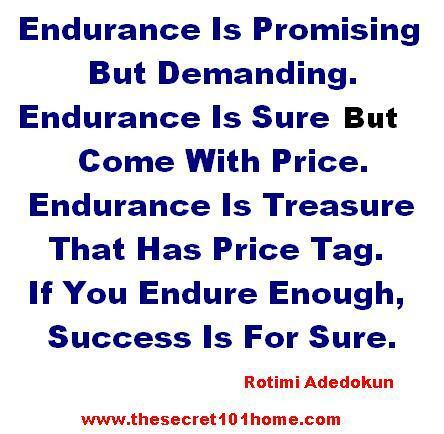 ENDURANCE: THE SECRET POWER OF LIVING LIFE. 1. Endurance Is The Mother of All Round Success. If You Cannot Endure You Cannot Have Results. Endurance Is Simply Going For The Crown Enduring The Cross. It Is The Price To Pay For The Future You Want To Live. 2. Don’t Think You Can Invest Little And Get Much. Life Will Only Give What You Deserve Not What You Desire. If You Really Desire Greatness You Should Invest Greatly. 3. Don’t Think Your Weakness Is Good Reason For Your Failure. The Secret Is That When You Lack Endurance, You Lack Almost Everything. You Cannot Have Success And Have Excuses. Good Excuse Are Always Welcome After You Have Good Results. 4. The Only Thing That Silent Competitor Is Endurance. It Is The Force That Help You To Start Before Others, Continue With Others And Never Stop When Others Has Stop. If You Have It You Have An Edge Over Them. 5. Endurance Is The Secret Of Above And Beyond That Place You On Platform OF Success Before Others. It Is The Force That Keeps You Moving When Others Are Tired. Don’t Stop When You Think You Should Stop, Rather Stop When You Can No More Move. This entry was posted in Life and Time Management, Self Development, Spirituality, The Secret, Vitamin Of The Mind and tagged Endurance, Endurance And Persistence, Endurance By Bishop David Oyedepo, Endurance By Jim Rohn, Endurance By Pastor E A Adeboye, Endurance By Rotimi Adedokun, Endurance Is The Rule Of Life, He That Endure To The End Shall Be Safe. Bookmark the permalink.